Situated in Nevada County, California, not far from the border with Nevada, Truckee is a small incorporated town best-known for its nearby ski resorts and interesting history. The town is situated in the northern part of California and covers an area of 33.65 square miles. It has an estimated population of around 16,000 people and is located in the Pacific Time Zone. Truckee was originally called Coburn Station in honor of a local saloon keeper, but was renamed after a native Paiute chief who offered a friendly greeting to the first European settlers to arrive in the area. Truckee started off as a railroad town and grew slowly over the years but is best known for its role in the Donner Party incident. In 1846, a group of settlers known as the Donner Party were making their way across the nation but came upon subsequent disasters and misfortunes, eventually turning to cannibalism when they arrived at Donner Lake in what would later become Truckee. Nearly half of the party members died and the Donner Memorial State Park, opened many years later, was named in their memory. Despite being the location of such a harrowing ordeal, Truckee gradually developed into a popular resort town due to its surrounding scenery. Various ski resorts and ski areas were constructed around the town, with Donner Lake and the nearby Tahoe National Forest also offering unique recreational opportunities and activities. The town itself also boasts some unique locations like bars and eateries, as well as the historic old jail. Elevation is a very important geographical term that denotes how high or low an area is in relation to sea level. It can be vital for a variety of uses, as well as having an influence on an area’s climate and conditions. The elevation of the city of Truckee is very high due to its location right by the Sierra Nevada mountains. Truckee’s elevation is 5,817 feet (1,773 m), which is much higher than many other towns and cities all around the United States and especially in the state of California. The mean elevation in California is 2,900 feet (880 m), making it the 11th highest state in terms of mean elevation. Truckee’s elevation is therefore more than twice as high as the state’s average. The point with the highest elevation in all of California is Mount Whitney, which is also the highest mountain the contiguous United States and has an elevation of 14,505 feet (4,421 m). Meanwhile, the point with the lowest elevation in California is Badwater Basin, which is also the lowest point in all of North America with an elevation of 279 feet (85 m) below sea level. Major cities in California tend to be situated at elevations much lower than Truckee. Los Angeles, for instance, has an average elevation of just 285 feet (87 m), while San Francisco has an even lower average elevation of only 52 feet (16 m). Other big cities in the state include San Diego, which has an elevation of 62 feet (19 m), the capital of Sacramento, which has an elevation of 30 feet (9 m), and San Jose, which has an elevation of 82 feet (25 m). Compared to all of these cities, the elevation of Truckee is several thousand feet higher. The high elevation of Truckee contributes to its climate. 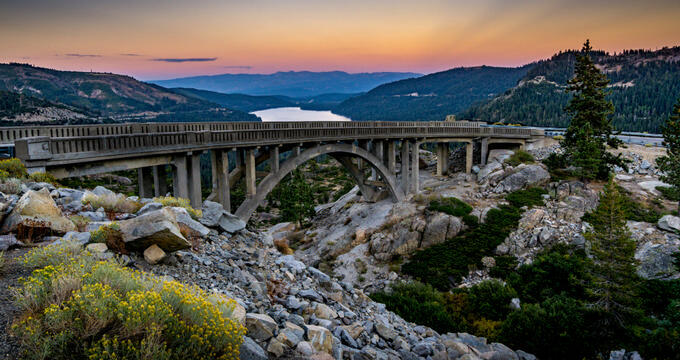 Unlike other Californian cities which enjoy hot weather for most of the year, Truckee has a dry-summer continental climate with distinctly cold and snowy seasons and mild, dry summers. The warmest month of the year in Truckee is July, which has average highs of 83°F (28°C) and lows of 42°F (6°C), while the coldest month is January, with average highs of 41°F (5°C) and lows of 16°F (-9°C). The area sees over 200 inches of snowfall each year and more than 30 inches of rain. Truckee is a seen as a great base for people looking to explore some of California's key natural sites like the Sierra Nevada Mountains and Tahoe National Forest. Donner Lake is also a popular recreational spot for the city and is regarded as a great spot for fishing, camping, hiking, and more. Various skiing resorts can be found just short drives from Truckee too including Alpine Meadows, Diamond Peak, Donner Ski Ranch, and Heavenly Mountain Resort. The city itself is home to various unique bars and eateries, as well as some interesting historic buildings where visitors can learn more about the history of the town and the Donner Party.